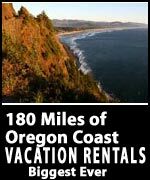 (Cannon Beach, Oregon) – Here you will find: upscale lodging, inexpensive, lodging near Cannon Beach, oceanfront, jacuzzi, hot tub rooms, balcony patio, vacation rentals in Arch Cape. See here for changing lodging deals, availability. Check back frequently. 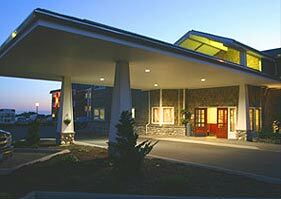 This page also features some exclusive lodging listings not found anywhere else. 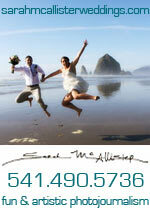 Also, click here for the Complete Guide to Cannon Beach - or the Bed and Breakfast Guide. Blue Gull Inn. They call it an â€œun-motelâ€� experience, and this little hacienda-themed gleaming wonder has that aspect down pat. Complete with a Spanish-style fountain in the middle of a rose garden courtyard, itâ€™s all just steps away from the beach and a short walk to downtown. Inside, youâ€™ll find soft off-whites and shining wood, with adorable little touches in the architecture like a closet tucked into the wall in a unique way, resplendent tile, to gleaming kitchen features. Many smaller rooms sleep two, but some larger accommodate four or six. Some of these come with a Jacuzzi tub, jetted tub or fireplace. Amenities: DVD players, free wi-fi, flat screen TVâ€™s, DVD library, onsite coin-operated laundry and beach toys. Enjoy a spa cottage with full kitchen or a smaller guest room with a kitchen, along with a backdoor straight to the beach. Thereâ€™s a barbecue onsite as well. Romance and birthday packages available. 632 S Hemlock Street. Cannon Beach, Oregon. 800-559-0893. Blue Gull Inn website. The Inn at Arch Cape. 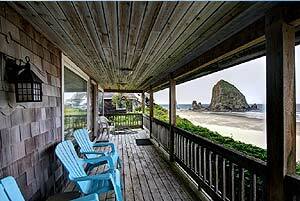 Truly get away from it all in tiny, laidback Arch Cape, just south of Cannon Beach. This historic gem â€” almost 100 years old â€” was actually once the post office for the village. Each updated room comes with a flat panel TV and WiFi, a fireplace made of beach rock, full kitchen, wonderful terrycloth robes, Esa spa toiletries, and a rain-head shower and pebble floor. Some units are pet friendly, while others completely pet-free. Firewood is provided to fuel those cozy fireplace moments. Then there are little touches like Pendleton throw blankets and Keuring coffee makers. Smaller rooms are perfect for couples while larger rooms (the suites) are exceptional for families. Many rooms open up into the community deck, which features chairs, a picnic table and an outdoor grill. 31950 W. Ocean Lane. Arch Cape, Oregon. (503) 436-2082. Website here. 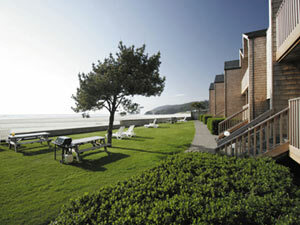 Inn at Haystack Rock. 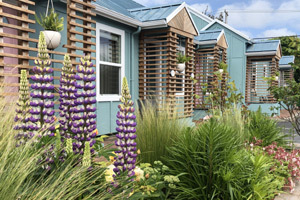 A mere three blocks from downtown and only a block from the beach, Inn at Haystack Rock is a charming, even slightly magical lodging in the famed Midtown area of Cannon Beach. In the center sits a garden courtyard with a Spanish-style fountain, giving it an extra sense of calming paradise. Gleaming white interiors with wondrous wooden touches, and each room comes with private patios. You'll find a barbecue area as well. Every unit has free wi-fi, flatscreen TV with DVD player, and there's a large, complimentary DVD library. Other amenities, depending upon room: jacuzzi tubs, fireplaces, full kitchen or snack kitchen, queen beds, and even a sofa. Some host two or three, while the two-bedroom suite holds up to six people and comes with a loft that has two bedrooms. Romance packages and birthday packages are available, which can include little wonders like a fresh flower bouquet, wine glasses, sparkling cider, or even birthday hats. 487 S. Hemlock. Cannon Beach, Oregon. 800-559-0893. Inn at Haystack Rock website here. Lighthouse (Vacation Rental Home in Cannon Beach). 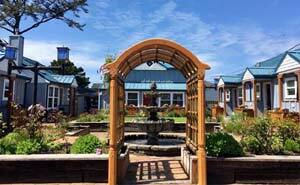 Right on the beach and in Midtown, Lighthouse is close to everything you love about this north Oregon coast town. The open floor plan is geared towards family living, including an enormous oceanfront deck and windows, with Haystack Rock in full sight. It's also dog friendly. Featuring two love seats and two easy chairs near a warm gas fireplace, you'll also find a 55'' flat screen TV. This lovely home sleeps 9 guests. 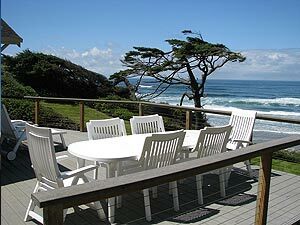 Room for eight at the dining table, or bring your meals onto that expansive deck and take in the ocean air as you dine. Other amenities: BBQ, four picnic tables, three bathrooms, four bedrooms, private entrance to beach, full kitchen, dishwasher, TV's in all bedrooms, wi-fi, basic cable, DVD player in all bedrooms. Parking for three vehicles. In the middle of Cannon Beach, Oregon. 503-436-0940. Website here - Book Now. 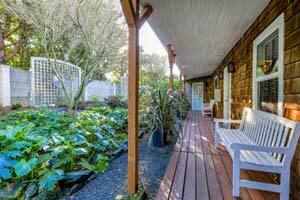 Arcadia Cottage, Near Cannon Beach. Just south of town, you can stay close to famed Arcadia Beach. This two-bedroom, one-bathroom luxury apartment sits high on a thickly forested hill, coming with its own private drive. It combines the feel of a luxury coastal chalet with the tranquility of a mountain retreat, with the ocean rumbling below and panoramic views of the Pacific from inside and on the patio. Features one queen bed and two twin beds, a large deck, flat screen TV, wifi, cable TV, and a gas barbecue. There's also a washer/dryer in the garage, and a dishwasher in the spacious kitchen. A beautiful dining table sits in full view of the ocean vistas. Vaulted ceilings, skylights and exposed beams lend a spacious feel to the charmingly cozysterior. Comes with two decks, one that looks into the lush forest and wilderness. Just south of Cannon Beach, Oregon. Arcadia Cottage Website Here. - Availability / Book Now. 855-219-4758. 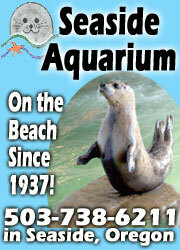 Beach House Vacation Rentals, Inc. Over 65 between Seaside and Warrenton; some pet friendly. All non-smoking; some offer specials. Many beachfront, or within a couple blocks of beach, in lovely, quiet neighborhoods. 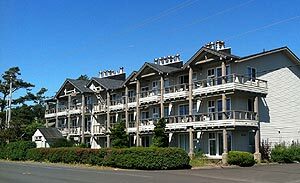 In Seaside as well as Gearhart, including modern condo overlooking Gearhart’s pristine beaches, or lakefront lovelies near Warrenton. May find ping-pong table, fireplaces, big yard, patios, barbecues, balconies and decks with stunning views, hot tubs, swimming pool access. Kitchens fully equipped. Seaside - close to Cannon Beach. 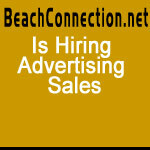 1-800-995-2796. www.beachhouse1.com. 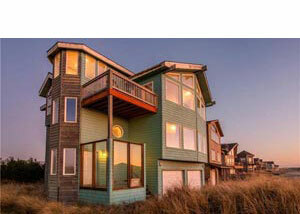 The Houses on Manzanita Beach. Unique vacation homes on the beach, all oceanfront, ocean view. Some pet friendly; great for large groups. Each w/ modern kitchens, internet, TV, phone, a gas grill, fireplace, decks, washer, dryer and dishwasher. You may find: grassy yard for kids, ping pong table, a pool table, wood burning fireplace, private sliding door from bedroom to deck, European fixtures, radiant floor heating, covered parking, dining area for 20. 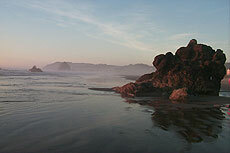 In Manzanita, 20 minutes from Cannon Beach, Oregon. (503) 354-4287. Website here. Clementine's Bed and Breakfast (north of Cannon Beach). An engaging historic experience, topped off by fine foods. There's even a vacation rental available next door. A stately Victorian w/ mix of Asian and European furnishings, with flowers from their private garden. All rooms have private baths, luxury linens and some with fireplaces or Jacuzzi tubs. Free wi-fi, cable TV. Large open gourmet kitchen. Free parking. 847 Exchange Street. Astoria (about 35 mins north of Cannon Beach, Oregon). 503-325-2005. Website.